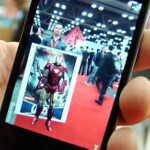 At the recent SXSW expo, Marvel comics displayed a new iOS app that turns characters on a printed page into larger than life 3D heroes. Marvel Editor-in-Chief Axel Alonso says that the company wants to use the new technology to grab new readers. Alonso said that Marvel has viewed printed and digital comics to be complements of each other, not competitors. He added that Marvel needs to strike a balance between the print comics they need to survive, and an awareness of future technology. Marvel Digital Media SVP Pete Phillips added that Marvel is bringing in a new group of readers which is exciting for him and the company. "Print and digital, that's the Holy Grail for us," said the executive as the new 3D app was displayed at the expo. Discussing how fast technology is changing, Editor-in-Chief Alonso said that all of the things that Marvel displayed at SXSW that drew oohs and aahs from the crowd will be laughed at and seen as corny in the next year or two. To Alonso, that is a good thing. "The future," said the executive, "is limitless." Just yesterday, we told you that some comic book companies including Marvel, are starting to offer comics in HD to match the Retina display on the Apple iPhone 4/4S and the new Apple iPad.